Acrylic surface coatings are used in all three of the paint and coatings market categories—architectural coatings, product finishes for original equipment manufacture (OEM), and special-purpose coatings. Protective coatings other than paints, such as fabric and leather finishes, floor polishes, and paper coatings, can also be based on acrylic polymers; however, these coatings are not included in this report. Acrylic coatings can be used in organic solventborne, waterborne, powder, or radiation-curable formulations. They are used mainly in architectural, or decorative, finishes, and to coat industrial goods. Acrylic surface coatings are the leading finishes used in the paint and coatings industry, having surpassed alkyd finishes over the past few years. Based on acrylic and/or methacrylic polymers or copolymers, acrylic surface coatings are noted for their inertness and excellent color retention when exposed to outdoor conditions. In 2010–17, consumption rose in most areas of the world. Acrylic coatings now account for about 25% of all coatings on a global basis. For environmental reasons, there has been a shift toward waterborne acrylics used in architectural and automotive coatings. Acrylic latex coatings have captured a good portion of the North American and Western European market for architectural coatings as replacements for solventborne coatings. Use in developing regions as replacements for solventborne coatings and other low-quality, low-durability budget coatings is expected to continue to grow. In the OEM automotive market, waterbornes account for 50–60% of the global market for automotive OEM basecoats, which is up considerably from 1997 when the penetration was about 20%. There is also use of acrylic latexes in the automotive refinish market in North America and Western Europe. In the United States, all major markets are mature. However, consumption of acrylic surface coatings in the architectural coatings market has increased at a rate faster than the overall market mainly because of greater sales of higher-quality coatings for interior use, which have been heavily promoted to the general public by mass merchandisers. There have also been higher sales of gloss coatings based on acrylic emulsions, which have replaced solventborne alkyd enamels. Consumption of waterborne acrylic coatings increased by about 3.5% annually from 2012 to 2017 as a result of the strong construction market. Future increases are expected to be only about 1% per year as the market is expected to plateau. 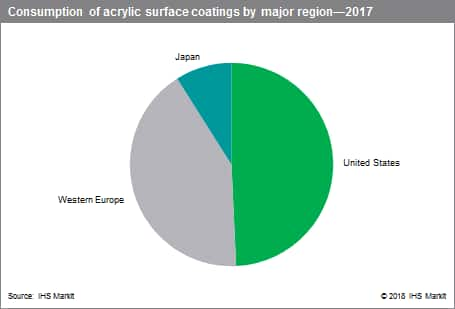 Consumption of acrylic coatings in the OEM automotive market grew by about 2.5% annually during 2012–17, but this market, too, should show little future growth. In Latin America, consumption of acrylic coatings is expected to rise again after the economic recessions in Brazil, Argentina, and Venezuela, which were caused by political instability, along with drops in commodity prices. The construction and automotive markets are expected to slowly recover. BASF has invested in acrylic-based raw materials and Arkema in a new emulsions facility in Brazil. Volkswagen has announced plans to add capacity in Brazil. Overall demand in Western Europe is not expected to exceed 2% annually during 2017–22. In Eastern Europe, consumption of acrylic coatings is expected to average 3% annual growth from 2017 to 2022. Automotive production will continue to increase in this region, as will manufacture of other goods for domestic consumption or for the export market. In the Middle East, growth will be about 4% per year as demand for higher-quality, environmentally friendly waterborne coatings for the architectural market will continue to rise. In Asia, there will be little change in Japanese consumption as the construction and OEM automotive markets remain flat. In China, consumption of acrylic coatings rose by just over 6% annually during 2012–17. The residential construction market is expected to grow by 3–3.5% per year as a result of the glut of housing inventory. However, the commercial construction market should grow faster, so the overall construction market is expected to rise by nearly 5% annually. Automotive and other industrial markets should continue to grow at higher rates, so overall Chinese consumption of acrylic coatings is expected to grow at 5–6% per year. In other Asian regions like India, South Korea, and Taiwan, production of acrylic resins for coatings is expected to grow at 4–5% annually. The largest global producers of acrylic emulsions, in order of global importance, are DowDuPont, BASF, and Celanese. These multinationals produce in every major region of the world. In China, there are numerous latex manufacturers, but many produce only low-quality products. Most producers of acrylic emulsions also market their products to other industries outside of coatings, such as adhesives, inks, textiles, and other. Also, many plants are multifunctional and capable of making non-acrylic-based emulsions. The cost of making these products is largely dependent on raw material costs.